Non-stop Rajasthan for fifteen days, giving you every bit of this vibrant state. From cuisines to castles from lakes to sand dunes, making this journey the never before experience. The comprehensive package tour is dedicated to the land of heros. Rajasthan is a destination where every step narrates the story of sacrifice and bravery. This tour is just an opportunity to interact with the people and see life from the close quarters. 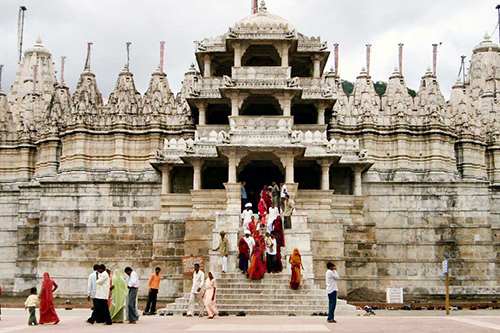 A comprehensive tour designed keeping in mind the diversity of cultures prevent in various parts of Rajasthan. “Rajasthan Darshan” brings the ethnic blending of Marwar and Mewar region? Of Rajasthan. This tour also aims to explore the topographical distinctions ranging from sand dunes to fresh water lakes. Rajasthan, dissemblance at its best. A land where the landscapes and dialects change at every thousand pace. Experience the same with our package “Pearls of Rajasthan” covering Udaipur, Jodhpur and Jaipur. Udaipur, city of lakes and once the capital of the Ranas of Mewar. The city is known for its fairytale palaces that will make your fantasies come alive. Jodhpur, the city of timeless architecture, was once the capital of Rathore Rajjputs in 16th century. Mehrangarh Fort and Umaid Bhawan Place, paint capturing images of castles and places in you mind. Jaipur, known as the Pink City promises a rich tradition of ornate handicrafts and sand stone places that speak volumes about the royal past of the city. Rajasthan a land of bewildering diversity of cultures, religions and traditions. This diversity has been captured in this package, giving the macro perspective towards this land of wonders. From the camel rides of Jaisalmer to the boat rides of Udaipur. This tour has it all to make this journey of exploration, a complete experience in its self. Jodhpur, Jaisalmer and Bikaner, the cities that narrate the success stories of bravery of the soil and the delicacy of the stonework and the might of the forts. Non-stop Rajasthan for fifteen days, giving you This package foretells the mystifying stories of the sand dunes. Jaisalmer the city of memories, most celebrated for its exquisite stone carved Havelis and the Golden Citadel-the Jaisalmer Fort. This package makes an effort to explore various cultures which have evolved from the desert life styles. Rajasthan is one of the most sought after tourist destinations because of its varied topography and rich wildlife. Its variety of breathtaking flora and fauna along with enchanting forts like the Jogi Mahal at Ranthambhore is worth a thousand visits. This package helps you to explore the best of wild Raiasthan. Rajasthan, a mystifying talisman of spectacular beauty ranging from the extremes of never ending sand dunes to the fathomless lakes of Udaipur. From savage-looking hill Forts of Jodhpur, to exquisitely painted palaces. From featureless deserts of Jaisalmer to carefully ordered grid-planned cities like Jaipur. This is Rajasthan. The very best of it. This package discovers the two most ethnic and celebrated erstwhile princely state. Bikaner founded by the Rajput rulers five hundred years ago is located deep in the desert. It holds some of the most awesome architectural wonders like - Bhanwar Niwas, Jaswant Bhawan, Junagarh fort and Kami Bhawan.Mandawa lies in the Shekhawati region and is known for its numerous Havelies ornated with beautiful frescos. It has also become a major center for ethnic handicrafts.